Now, saying “X took me out of the story” doesn’t mean that “Until X I thought that the story was real and then all of a sudden I got dumped back into reality”, which is what both Steven and Dave are arguing, but rather that “X broke the mood” or that “X broke the rules”. […] saying “X took me out of the story” isn’t so much about breaking “suspension of disbelief” or puncturing an illusionist surface as it is about an audience member feeling that the art maker has broken the rules of a game they were playing or that the art maker has failed to properly set up or cue a change in these rules. In fact, I have witnessed people use the phrase to mean, “Until X I thought that the story was real and then all of a sudden I got dumped back into reality.” (Not that I can point to specific examples of people using the phrase with such a connotation, so take my claim with a grain of salt if you don’t have your own anecdotal evidence to back it up.) On the other hand, J.W. is correct in suggesting that I should not have yoked the phrase so securely to the illusionist school of experiencing art implied in the phrase “willing suspension of disbelief.” J.W.’s explanation of the phrase probably applies more often than not. But I think what is underlying what both Steven and Dave are saying is their belief that being truly engaged with a work of art means analyzing and interpreting it. I even get a sense that they feel that an audience has a kind of moral imperative to analyze and interpret a work of art, or that this kind of analysis and interpretation is morally superior to old-fashioned “appreciation” of art works. […] Steven and Dave, of course, aren’t alone. Their kind of analytical criticism is practiced throughout academia. Personally, I think that this almost obsessive focus on analysis and interpretation has led to a whole bunch of “art critics” who don??????? ?t have anything resembling traditional aesthetic sense. By approaching works of art merely as a group of symbols that need to be decoded in order to discover their “meaning”, these critics have cut themselves off from being able to appreciate the beauty of, to take pleasure in, or to be moved by a work of art. In fact, it becomes impossible for them to differentiate between, say, a Willem De Kooning painting and an advertisement for toothpaste. After all, both the painting and the advertisement are equally suitable objects for critical analysis and interpretation. But I’m not talking about paintings or toothpaste ads, I’m talking about works of narrative art which, more often than not, have large verbal components. So what does constitute “old-fashioned ‘appreciation’” of narrative art, if it doesn’t include interepretation and analysis—however informal and schematic? Bryan Lee O’Malley has uploaded an image of the watercolor drawing he did for Shane Bailey , winner of the Special Art Appreciation Award in the Scott Pilgrim Contest: see the drawing at Radiomaru. This was supposed to be the night I announced I was going on hiatus through the end of the month, but suddenly it seems that may not be the case. Today was full of all sorts of comics, Y: The Last Man and How Loathsome and The Nikopol Trilogy and Spider-Man India and The Originals and The Question and X-Statix . That last one is where this post comes in, although there are points I want to make about Y as well. And for some reason the “IBCD” joke in Spider-Man India made me giggle a lot. But the most important thing on my mind is a question about who on earth writes the “Previously…” text at the beginning of X-Statix . Not only does this begin with the positively sick-making, “X-Statix has scaled the mountain of Professor Xavier’s dream to new heights,” but it then manages to drop to not-so-new grammatical depths. Is it terribly, terribly difficult to differentiate between transitive and intransitive verbs? I’ll give you a hint, even — NO. That is why it made me scream to read about “Lacuna, who now lays recovering in intensive care.” You know who’s really sick? The person who made that ridiculous error and all the people who didn’t scream upon seeing it as it went off to the printer. And now me, too. Admittedly I was sick to begin with, which is why I’m heading off to bed now and one of the reasons you probably won’t see much of me for the next few weeks (not that this differentiates them much from the last few). After some more time lying down, I will recover, but luckily I had so little faith in the technical writing skills of most comics folks that I won’t let that keep me down. The problem isn’t that this Batman is different, it’s that Morrison tries to maintain both are the same man. “I’m opening the sci-fi closet, Alfred. Don’t tell my friends in the G.C.P.D. about this.” The notion that the Batman who patrols Gotham, trying to prevent the sort of tragedy that scarred him as a youth, would have a box full of seemingly magical toys just doesn’t wash. […] It took me out of the story. Me, I tend to think it’s perfectly valid to have Solo Batman and JLA Batman being different, and blurring the lines between the two is fine if the tone of the story allows it (as the Classified story does). Call it Hypertime, call it selective continuity, call it fudging — why not, if you can get a good story out of it? “It took me out of the story.” “It took me out of the story.” When people say this, I feel like Brad Stand in I ♥ Huckabees . What are people doing in the story in the first place? They’re readers, not characters. OK, I’m being deliberately obtuse. But people talk about being immersed in the story, forgetting they’re reading a book or watching a movie. That can’t be what they mean. How could they really forget that they’re scanning a sequence of words (or images) on a page, or that they’re watching a sequence of images projected on a screen? And “willing suspension of disbelief.” I think people don’t mean this literally—how could they, and why would they want to, believe that the story they’re reading is true?—but the language of forgetfulness and belief seems unhelpful, at least for me. I want to remember, not forget, that I’m reading a text. This language must be related to that some people hate criticism and analysis of texts. They complain that dissecting a text takes all the fun out of it—maybe because it forces them to abandon their strategies of immersive forgetfulness and belief, which seem childish and naïve to me. First, thanks to everyone who entered. We received many more entries than we expected. Second, to everybody who entered and didn’t win, or who didn’t enter but wants to read Scott Pilgrim : the Scott Pilgrim web site and Bryan Lee O’Malley’s web site Radiomaru have information purchasing the book from several online merchants, including how to order directly from Bryan. Scott Pilgrim Contest Countdown: A Matter of Hours! This is your last reminder, and I’m beginning to feel like I’m doing advertisements for a carpet warehouse or something. Do you want to read Scott Pilgrim’s Precious Little Life ? Then you’d better take this opportunity to email us at contest@peiratikos.net to let us know what makes you think you’d like it. Read full details about the fabulous prizes, including a watercolor by creator Bryan Lee O’Malley for more information. There’s been a very minor family emergency and I’m taking care of my littlest brother tonight, so all entries received by the time I get up tomorrow morning will be considered for prizes. Check back tomorrow for the winners! Regular programming will return later this weekend. 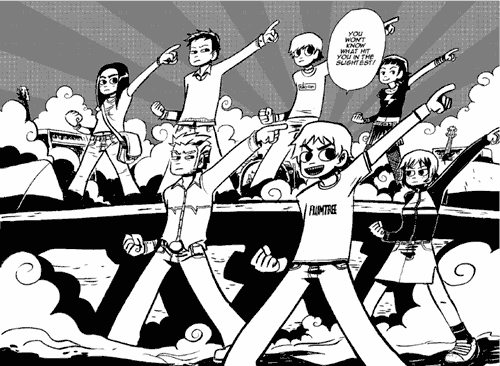 Scott Pilgrim Contest Countdown: One More Day!